During the meeting, Indian Army chief General Dalbir Singh Suhag appreciated Vijender Singh for turning professional and congratulated him for three consecutive wins in 2015. 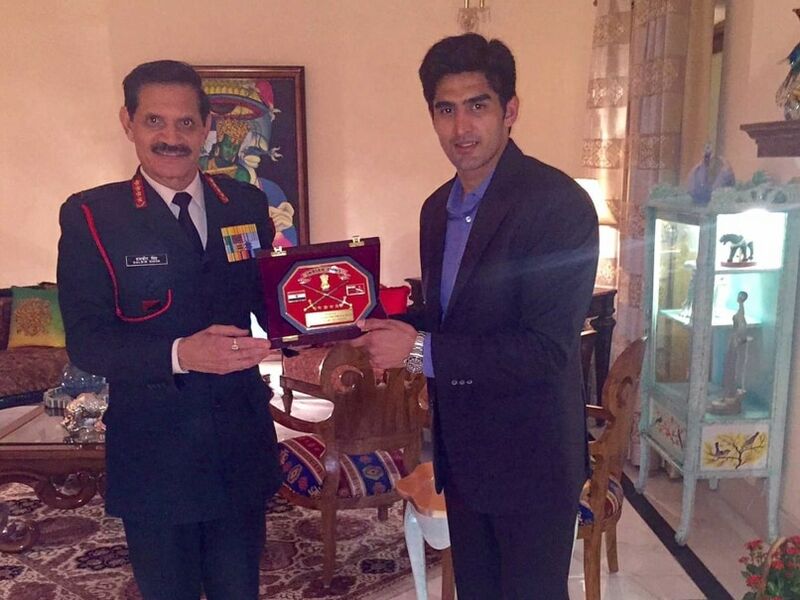 Indian professional boxer Vijender Singh on Tuesday met Indian Army chief General Dalbir Singh at his residence here. During the meeting, the Army chief appreciated Vijender for turning professional and congratulated him for three consecutive wins in 2015. During the hour-long meeting, Gen Dalbir Singh also felicitated Vijender. "It's an honour for me to meet the Army chief General Dalbir Singh. He is very fond of boxing. He told me that he is following my career from the days I started amateur boxing. I am happy that he is also following my professional bouts," said Vijender. "He appreciated my decision of turning professional and winning three consecutive bouts. I would like to thank him for the felicitation. It's a big motivation for me, getting honoured by the Chief of Army Staff. He also wished me for my next fight, scheduled to be held in Liverpool, on February 13." Vijender, who is on a two-week vacation in India, will be flying back to England later this week.